New for 2016, Springfield Armory introduced an upgraded version of the EMP. An extended length and height make the new EMP four-inch Lightweight Champion easier to shoot while adding ammunition capacity. The all-new Springfield EMP offers a longer four-inch barrel that presents a longer sight radius and simplified practical accuracy. Depending on specific ammunition choice, the extended barrel length will also add an extra 20 to 60 feet per second of muzzle velocity. That helps premium self-defense ammunition perform up to its designed potential. "While the original EMP three-inch models are surprisingly easy to handle, we wanted to continue to make it better," Springfield Armory CEO Dennis Reese said. "The extra weight up front on the new four-inch model not only helps dampen felt recoil, it helps control muzzle flip, allowing shooters to complete faster and more accurate follow-up shots." The frame height has also been carefully increased with similar proportions. 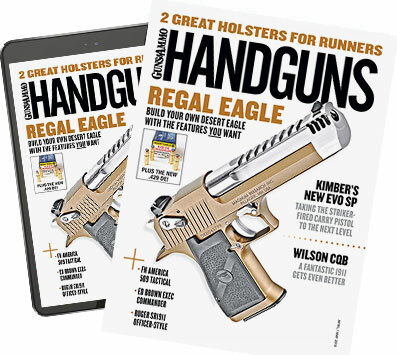 The new grip allows plenty of room for a solid two-handed hold, even for shooters with larger hands. While the original Springfield EMP 9mm held nine rounds in the magazine, the new four-inch model fits ten plus one in the chamber. The new model retains the same grip circumference found on the original EMP. Like the original, the Springfield EMP four-inch sports slim-line Cocobolo wood grips and two-tone forged 416 stainless steel slide and 7075 black anodized aluminum frame. A fiber optic front sight and two-dot, low-profile combat rear sight for effortless target acquisition. "It's an elite quality pistol," Reese said. "regarding size, this Springfield EMP four-inch is one of the smallest on the market. The four-inch slide allows for a more user-friendly experience while the smaller grip maintains the optimal size for concealed carry."